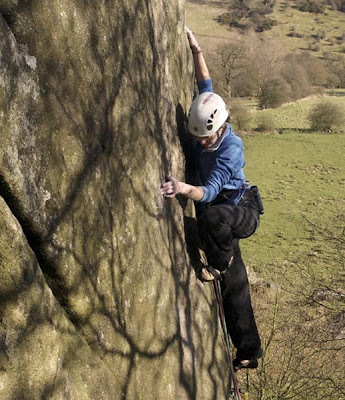 Katy Whittaker climbing Kaluza Klein, E7 6c. Robin Hood Stride. [Hot Aches Images]. The route hungry Whittakers were back in the Peak after a trip to Spanish limestone and were waiting for good weather to get onto their latest projects. 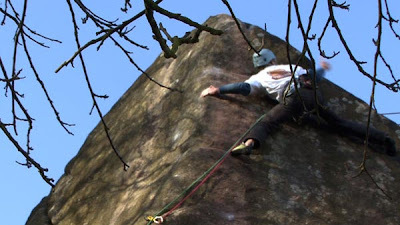 The last time we filmed Katy she succeeded on her hardest trad route ever, flashing E6. 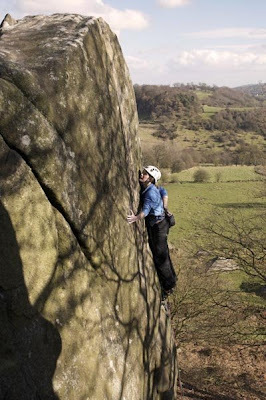 Now she had her sights set on climbing her first E7, a Johnny Dawes route called Kaluza Klein at Robin Hood’s Stride. E7 is a grade climbed by very few women. How many? It’s hard to be sure. Lucy Creamer, Lisa Rands, Katherine Schirrmacher, Lucinda Hughes, Airlie Anderson, maybe one or two more. A small list, and none anywhere near as young as Katy. Ryan Pasquill belaying. [Hot Aches Images]. Coincidentally Katy’s brother Pete had climbed Kaluza in 2006 when he was just 16. In fact his intention had been to onsight it, but he settled instead for a very quick head-point. Also at the time Pete had spotted an ‘unclimbed’ line on the arête to the right of Kaluza, and after some research (and cleaning) it seems that the first ascent was indeed up for grabs. The team had recruited a new belayer for the day. The usual custodian of the ropes was Jill, their mother. Pete explained though that Jill wasn’t particularly happy when the belay duties required stage diving off the ledge, in order to take in enough slack to stop the climber hitting the ground. Ryan Pasquill seemed far more at home in performing this particular role. Katy was up first, the epitome of cool and collected. “Far more nervous playing Mario against Pete [than now]…” apparently. The ascent was swift. A ‘big moment’ near the top when a Katy didn’t get a hold right - she span out rightwards – a moment of decision for the jumping belayer? - then she got it right, reached up, and pulled over the top. Next up was Pete, who was equally matter of fact the ascent ahead of him. 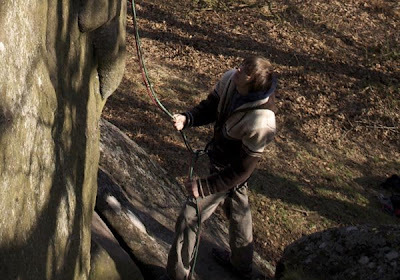 Pete Whittaker on the first ascent of Captain Calamity, E7 6c. Robin Hood Stride. [Hot Aches Images]. After lots of brushing he headed off and totally cruised Captain Calamity. Pete Whittaker after the first ascent of Captain Calamity, E7 6c. Robin Hood Stride. [Hot Aches Images]. "Hard E7" (E7 6c) was the verdict. Another impressive first ascent from the the very keen youth.